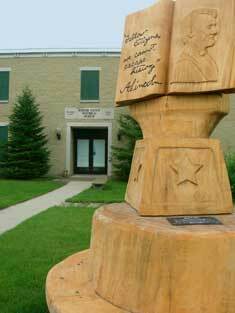 McHenry County History to enrich life. The West Harmony one-room school program and museum tours are offered throughout the school year for third-, fourth- and fifth-graders, with the exception of January when no school programs are scheduled. The society offers two-hour programs exclusively in the one-room, 1895 West Harmony School. The two-hour experience features lessons, music and games at recess. We can accommodate about 32 students. We provide suggestions for costumes that we encourage students to wear. Prior to your visit, you will receive a cover letter. Post activities are available. A more expansive, two-hour tou includes the 1895 West Harmony School, the museum and an 1843 log cabin. Available times are from 9 to 11 a.m., 9:30 to 11:30 a.m. or 10 a.m. to noon. Four weeks notice is preferred, whenever possible. On Thursdays and Fridays we offer 2- hour tours of the museum including the one-room school and an 1843 log cabin. Times: (9 to 11, 9:30 to 11:30, or 10 to noon.) We can accommodate up to four classrooms at one time, or about 100 students. We suggest taking two days for larger groups..
A 40- minute video, titled "The History of McHenry County," is available through your local library or the regional school superintendent’s office in Woodstock. It and a DVD on McHenry County barns also may be borrowed from historical society. We may be able to supply speakers/presenters for classrooms on topcial areas of interest about McHenry County, provided arrangments are made well in advance. Call the office about availability and desire topics. The museum tours and West Harmony programs are free to schools whose townships and/or municipalities become governmental members of the Society. Programs at schools located in non-member areas cost $3 per student. Home-schooled students, as well as those working on special research projects, may qualify for free admission to the museum. For information or to set up a research appointment contact the office. Our “Life Before Series,” available here under the Research Library menu, provides short accounts of everyday life experiences with a local slant. Please peruse our website for additional programs and/or projects during the year, or call us at 815-923-2267. The 1895 one room West Harmony School has been part of the McHenry County Historical Society Museum since March of 1988. It is a representation of the type of building and local education system that prevailed in this county until just after World War II. In 1945 this county had 127 separate school districts, each with the authority to levy a tax for school purposes. Teacher packets, containing this information and more, will be made available once you reserve a tour date. Group tours and volunteer opportunities are available for Scout troops. Eagle Scout project opportunities. Contact the museum for details. 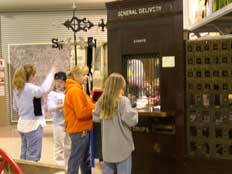 (shown above) Students visit our historic Post Office inside our historical museum in Union.